I am obsessive about spring cleaning and for the holidays. I have an entire house full of people coming from all over every year. They drive for hours to get here. We cook for days in preparation. The spring or holiday cleaning? It starts weeks before. This is including the fact that I hire a team of 2 house cleaners to come in for a day. My house isn't huge. It is a normal house. I'm just super obsessive twice a year during spring cleaning and holiday cleaning time. Everything has to be perfect. Baseboards, ceiling fans, walls, and behind the fridge is just the start. Everything is scrubbed, dusted and shiny. Before becoming "I&E Staff Support" for this website I was just like everyone. I didn't know anything about cabinets. Traditional looks so good, and we just had to have real wood. The term "traditional" means those classy insets in the doors, those indentations. I didn't know that before. I also had no idea that real wood in the cabinet industry didn't actually mean Real Wood. It meant a veneer of a certain thickness on the cabinet door. For spring cleaning or holiday cleaning? That panel that is recessed for 'traditional cabinets'? *Sigh* They are a pain to clean. Over the years it just gets harder. My spring and holiday cleaning comes to a snail's crawl when I hit this task. The veneer means you have to be careful not to really, really put the elbow grease on. The stain and finish means you can't use amazing cleaners - they will pull off the top coat or make it cloudy. Give it around 7 years and you'll be painting those expensive 'real wood' cabinets. ... That works for a while until the paint starts to peel. Next time I'm going to go Contemporary - No grooves or recesses for me! I will also skip the 'real wood' veneer. Mylar is worth checking out. No paint to peel, no finish for most cleaners to hurt or cloud. Easy spring cleaning and holiday cleaning! The idea that contemporary is sterile or boring is just not true. It can be, for sure - if you let it but so can any kitchen! The ideas are out there. Really, what is shocking is the idea that we need a few indentations in each door to add ALL the character to our kitchen!! 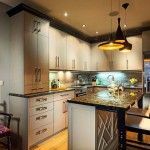 Lots of great ideas for contemporary kitchen cabinets with vibrant color or with neutral colors that bring character, depth and life into the home are on the internet. 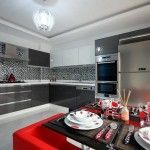 Pick out the colors you are sure to love for many years and pair it with the right tile and kitchen design. You will find that flat kitchen doors are very pleasing to the eye, will last a very long time....and very easy to clean! 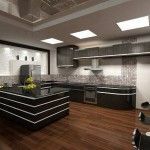 Contemporary kitchens can be warm. Flat cabinet doors make cleaning easy. 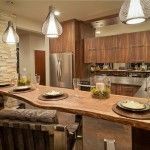 Lighting & counters make a difference!